The Most Complete, Step By Step Diabetes Solution Program is now available on 5 CD's or MP3 format. 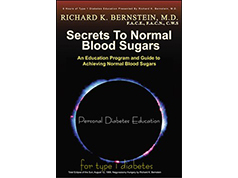 A compilation of his two best selling books, Diabetes Solution, and The Diabetes Diet, the Secrets To Normal Blood Sugars contains new, more up-to-date information. 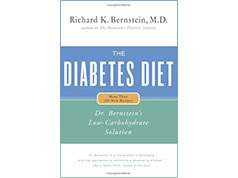 A revolutionary new low-carb diet for diabetics by the doctor who pioneered a successful new approach to the disease — with 100 original mouth watering recipes. Although some diets, like South Beach or Atkins, will lead to weight loss in the short term, they don't teach dieters how to make the lifestyle change necessary to keep the pounds off. Such diets don't remain faithful to the science behind low-carb eating, but instead allow the return of bad habits to undo their early benefits. The Complete Guide to Achieving Normal Blood Sugars. 2011 Edition includes information on new technology, new drugs, new methods and new recipes. 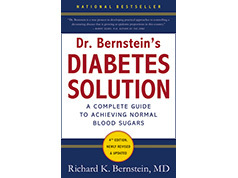 Whether you are newly diagnosed or a lifetime veteran of Type 1 or Type 2 Diabetes, Dr. Bernstein, a renowned and even revolutionary figure in diabetes treatment and diabetic himself, will show you how you could stop the roller-coaster swings in your blood sugars, steady your glucose levels, reduce your insulin intake and enjoy the same level of good health that nondiabetics have. 1000+ Answers Your Doctor May Not Know or Tell You. 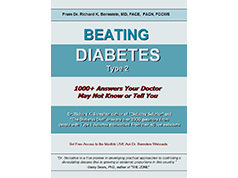 The idea for this ebook grew out of our last 40 monthly webcasts, where patients and medical professionals asked questions about their diabetes or about their patients with diabetes. It has more than 1000 questions and my answers to many difficult questions. Available for all the eReaders and also as a pdf file.